We are offering Ink Cartridges to our customers. 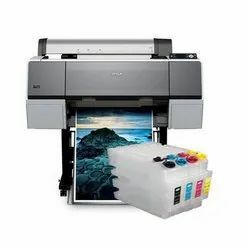 An ink cartridge or color inkjet cartridge is a replaceable component of an inkjet printer that contains the ink (and sometimes the print head itself) that is deposited onto paper during printing. We specialized in e-Waste/recycle product collection and Trade. Since 10 years we are in trade of electronically tested V/NV - HP | Canon | Lexmark toner/empty inkjet cartridges in volume. We supply large quantities within a stipulated time frame of all your needs from a one point of call for most of your services. For availability, please send us your query. Keeping in mind diverse requirements of the clients, we are presenting a quality tested array of Inkjet Cartridge. The Inkjet Cartridge we offer is recommended by the clients for their wide use. Our products are available in various colors that can be customized as per the requirements of the clients. Epson Printer Continuous Ink Systems - CISS, Epson Printer Continuous Ink Systems - CISS, the printing revolution starts here with our new amazing Continuous Ink Supply System. The large external ink reservoirs continually feed the cartridges with ink through silicon feed tubes. We are offering a wide range of Re manufactured Inkjet Cartridges. We do not only refill ink, first we check the complete cartridge, test the circuits, clean the cartridges in vacuum cleaning machine and then fill the ink and make physically test on the printer and then pack.